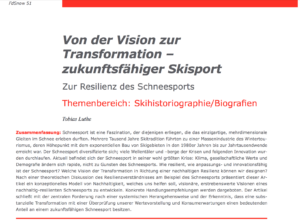 Home / posted / New publication: The Resilience of Snow Sports: From Vision to Transformation. Snow sports are a fascination that succumbs to those who have already experienced the unique, multi-dimensional pleasure of gliding in snow. Several thousand years of ski tradition have led to a mass winter tourism industry that peaked with the exponential construction of ski resorts between the 1980s and the millennium change. Snow sports became more diversified over time; they went through many wavy developments of crises and subsequent innovation. At current, snow sports are experiencing their biggest crisis: climate, social values and demographics are changing rapidly, not in favour for snow sports. How resilient, how adaptive and innovative is the snow sports sector? 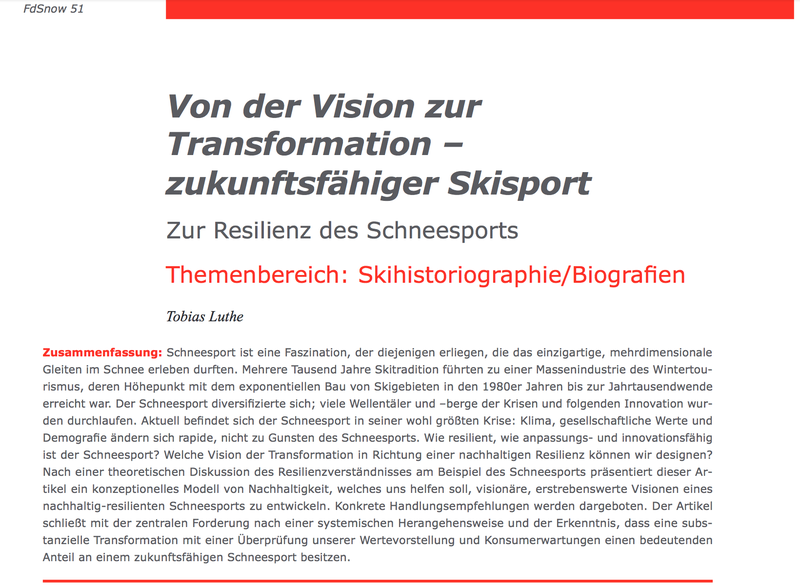 What kind of vision for the transformation towards a sustainable, resilient snow sports model can we design? Following a theoretical discussion of resilience illustrated on the example of snow sports, this article presents a conceptual model of sustainability that aims to help us develop visionary, worthwhile visions of a more sustainable, resilient snow sports sector. Concrete recommendations for action are presented. The article concludes with the need for a systemic approach to solving a complex problem, being aware that a substantial transformation requires the review of our value perception and consumer expectations as significant contributors to resilient snow sports.